This is what this brave, caring lady set out to do several years ago after once again triumphantly battling an aggressive cancer. After reading a story on the American Dream Foundation, Wendy saw that were was no Canadian organization addressing the last wishes of critically-ill adults. Originally, with the loyal and heartfelt support of family and friends, neighbours and professional acquaintances, she planned and managed to fulfill wishes for people who were battling serious illnesses and had received a dark prognosis. With less than one year to live, individuals want to live to the fullest, often wishing to create last memories with their loved ones, a spouse and sometimes an entire family. As the word spread, Wendy Grahl saw the need to create a foundation that would legally raise funds to fulfill wishes not only in the Edmonton region, but also in Alberta and eventually across the nation. The Angels Anonymous Connection got its start in 1996, becoming an official charity in August of 2002. The first wish Angels successfully tackled was that of a lady in Nanaimo, BC who was a huge fan of Loretta Lynn, the iconic singer. Knowing that time was of the essence, Wendy used her good heart and research abilities and managed to secure the shipment of several items of Lynn’s memorabilia, to make this terminally-ill BC lady’s last days a little happier. Wendy Grahl has connections in our capital region. Operating the charity from her home office in Edmonton, she has had generous support from several Wetaskiwin and Pigeon Lake friends over the years, and her son lives near Millet with his family. Nowadays, Angels Anonymous deals with last wishes originating in every Canadian province. Last year, 22 wishes were granted to terminally-ill patients with less than one year to live. In the beginning, each wish was costing an average of $2,500 to grant for a family of four, but these days the costs have gone up. Some wishes that involve a trip and hotel stay can cost more than $5,000 each! Angels Anonymous and its board of directors understand they need to fundraise all year round. They are now approaching corporate sponsors, something they have not tackled in the past. They also hold two large fundraisers every year, on top of their regular day-to-day reception of much-appreciated individual donations. Their next fundraiser is planned for June 6th. ‘When Angels Connect’ has a full agenda of Live Auction and a dinner, activities for young guests and a stellar line-up of MC and speakers. 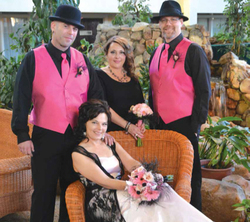 On February 7, a Celebration of Life and Love began at the Nisku Inn, where a photo session reunited Mel and Damian with family members, some of whom came from as far as British Columbia and Quebec for the event. Mel suffers from a rare form of breast cancer that has aggressively spread to her liver and her brain. A mother of four boys, living with them in the City of Leduc for 13 years, Mel recently moved to Edmonton to be closer to the Cross Cancer Institute. Her prognosis is very bleak. No intervention will change the outlook and hearing that she has between six and twelve months left, Mel and her soulmate Damian decided they wanted to be officially ‘committed’ in front of family and friends, so the planning began and culminated in a lovely ceremony of shared love and promises with no timeline. With Mel unable to drive or work and her boyfriend caring for her fulltime while on medical leave, the couple is financially stressed. A letter to Angels Anonymous earned support to acquire essential elements of this ceremony and reception. A wonderful wedding cake, flower bouquets, a hall, among other critical items for a splendid celebration of love and life. A generous couple, friends who own a Nisku company greatly supported the event, paying for flights and for a DJ. Melanie is happy that her wish to show her love to Damian in front of loved ones has been fulfilled and the event was broadcasted on CTV News, which also offered them an entire wedding video. The Edmonton RUSH, the national lacrosse team heard from a supporter of the Angels Anonymous Connection. On Friday, February 27, the Rush offered a portion of the sale of Grandma Rush bobbleheads to the group. Great support! Angels can be contacted for sponsorship, wish requests and donations at 780-468-5506. You can also visit their website, www.angelsanonymous.org. Together, let’s get a few more wishes granted. Pictured: Melanie Benoit, formerly of Leduc, and soulmate Damian celebrated their love with best man Todd of Montreal and maid of honour Lisa of Leduc. Photo by Dominique Vrolyk.